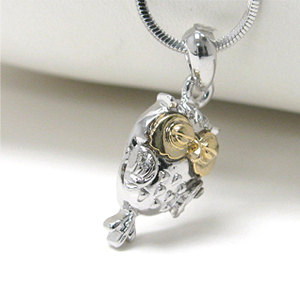 White Gold Plated Two Tone Owl Pendant Necklace. Material : Alloy (Lead & Nickel Free). Plating : White Gold. Color : Silver, Gold. Design : Owl, Bird, Animal. Weight : 7 gram. Length : 16 inch. 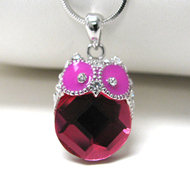 Pendant Size(Including Bail) : 12 x 28 mm (0.5 x 1.125 inch). White Gold Plated Two Tone Owl Pendant Necklace.